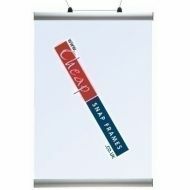 Poster Hangers Cheap Banner Snap and Banner Clamp for Hanging Posters allowing you to suspend your posters in style. Available in two systems and a range of sizes from 300mm wide to 1,500mm wide - giving you great choice. This is an anodised aluminium bar with a snap open and shut mechanism to allow you to suspend your posters, gripping them at the top and bottom. From only £9.50 + VAT - cheap prices and next day UK delivery. 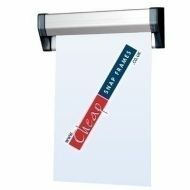 Our poster hangers are perfect for a suspended display or a window display. Perfect for displaying large artworks, in windows or in shops above the aisles. 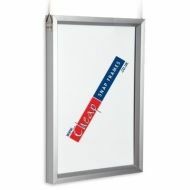 The poster hangers have an anodised aluminium bar which snaps open to grip your poster. There is a second aluminium bar which holds your poster in place at the bottom. The top bar of the poster hangers has two hanging hooks which can be adjusted to fit as required. Our poster hangers come in different sizes to fit your posters but for slightly heavier posters (between 50 and 500 microns) our poster clamps would be better. These also come with two anodised aluminium bars and as per the poster hangers, work in just the same way. Where might I use a Poster Hanger? 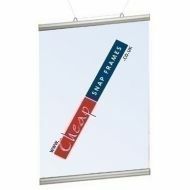 Our poster hangers are suitable for suspended displays or notices and are perfect for larger shops where offers and notices are displayed above the aisles. They are also suitable for use in garden centres, hairdressers and beauty salons. What do I get when I buy a Poster Hanger? You get two anodised aluminium bars which have our simple snap frame system to hold your poster in place. Two adjustable hanging hooks are also supplied. All you provide is the wire or hanging mechanism from your ceiling. (We do also sell hooks and suspended ceiling clips if you need these). What size poster can your poster hangers support? Our poster hangers can support a wide range of poster size from A5 signs to 2m long posters, we can also make bespoke sizes. However, the poster hangers will be suitable for posters up to 50 microns. Our poster clamps will support posters from 50 to 500 microns. Will I be able to change my poster easily? Yes. The top and bottom aluminium bar on the poster snaps uses the same snap frame mechanism featured in all our snap frames. 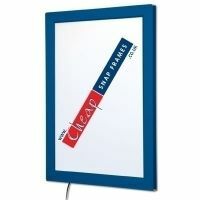 Simply lift the top and bottom bar up, place your poster and snap the bar back into place. On the poster clamp system you twist the end cap and the poster slides across into place. Instructions are included for your convenience.